When I first moved to Maui in 2007 I learned to paddle board and I can honestly say that the ocean experiences I’ve had since have changed my life. Here is a recap of one of my first such adventures. I headed out on my paddle board very early one morning looking for . . . an experience. The ocean and winds were calm so I ventured further out than normal and probably further than would have been advisable given that the sun had not yet risen and I was the only one on the water as far as I could see. But I REALLY wanted . . . an experience. I paddled for a while, breathing deeply into the fears that sometimes surfaced in my mind and stomach. Fears about sharks and unexpected winds and my own vulnerability and mortality. As soon as one set of inner "disturbances" or "ripples" of fear dispersed, another surfaced. But I kept breathing into them and relaxing my body and mind. 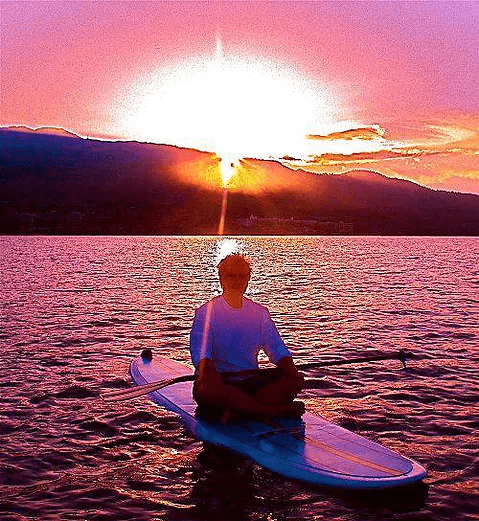 Setting my sights on the horizon as I paddled forward I kept breathing, waiting patiently for the layers of my thoughts to disintegrate so that I could simply be "present". And finally this thought surfaced . . . “But I'm so far from shore!”. That struck me as an obvious but interesting thought to have. I looked down at my feet standing on top of my beautiful red striped board and I thought . . . “But I am HERE, standing on my board!". Life isn't on the shore. Life isn't elsewhere. It's here. Like it or not, where ever we go, there we are. And I was here, simply standing on my board, holding my paddle, somewhere out on the ocean with Maui’s shore far in the distance. And that is all. And that was the last of my distracting thoughts for that morning. And finally . . . I was present. I asked myself what was I was searching for out here on the ocean, alone, so early in the morning? And the thought occurred to me . . . "something sacred . . . something free". I wanted to touch on something that was intrinsically just it-Self. Something completely free and wild. Something that was not defined by it's productivity or assigned some relative value or worth based on what it did or didn't do. Something that didn't need to practice "being". I wanted an experience that could remind and reconnect me with the essential part of my self that existed before all the concepts, ideals and values have been layered and layered upon me. I wanted to experience the part of me that transcends even the loftiest and most well-meaning of spiritual aspirations. Spiritual ideals, values and concepts are merely vehicles to guide and transport us to a place where they are no longer useful or relevant. They are only stepping stones, not a destination. I wanted to experience something natural. Something sacred . . . something free. I wanted to feel true freedom. I wanted to experience my essence. Any thoughts or rational thinking of what our experience of true essence and presence may look or feel like are often just distractions and obstacles to experiencing the real thing. We can "Ohm" and "affirm" all we want but until we throw our spiritual concepts and emotional attachments away we're still going be just "Ohming" and “affirming". It's like we can swing on that swing over and over again until we go higher and higher, but then if we don't jump off that swing at just the right time and soar freely through the air, then we're just clinging to a rope tied to a tree. Do we want to experience life as a kite from the end of a string or do we want to soar and fly free? We hug our concepts and beliefs close to ourselves like a favorite soft blanket, protecting us from the cold. We hug it so close we don't even realize that we've blanketed our eyes and hearts as well. Even the most comforting, well-meaning thoughts and intentions can blind and separate us from what is present and right in front of us. It's like now it’s Spring we forget that we’re still carrying the blanket and snow boots we needed in winter. I'm realizing that "here" is very different than anywhere I've ever been so far in my life. And being "here" is requiring a lot more breathing and letting go. We can not take all our "knowing" with us to a new place! We can't wrap all our "knowing" around us and then expect to be touched by a greater experience of wonderment and awe! True inspiration doesn't come from a place of "knowing"! Quite the opposite. True inspiration comes from venturing into unknowing, new territory. Letting go into a new awareness. A new breath. An experience of "grace" can't survive an inquisition or desire to sustain it. You have to be unquestionably standing in the presence and experience of it. You have to be willing to let go of what you know, of what is familiar to relinquish control and experience something new with open eyes and hearts. I started paddling out on my board hugging my identity, concepts, fears and aspirations close to me. And one by one I dropped them into the ocean and they submerged. I became more and more vulnerable and present as I disarmed myself of my illusion of separateness and of my identity. 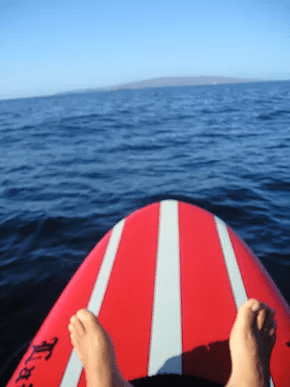 And finally there I stood alone, just me and my board a mile or more off-shore watching the sunrise shimmering brightly over the crater peak of Maui. And then I heard it. A huge, wet exhale. The sound of water and air spraying out with one giant breath into the atmosphere. Compared to the quiet lapping of water on my board this new sound was like a freight train blowing it's whistle into the dawn. And I then I heard it again and I turned to look and saw it! It's dark long rolling back, surfacing up along the water and then, many yards later, rolling back down into the ocean. It rolled and rolled, submerging like a giant sea serpent from some mythological fairytale. It's body was maybe 45ft. to 50ft. long and it's huge tail fins were wider than the full length of my board. It gracefully sliced through the water until it completely submerged with a playful SLAP of it's tail fin! This beautiful humpback whale, less than 30 ft. away, was now heading directly towards me! I dropped to my hands and knees on my board looking for more stability. It was once again quiet. Very quiet. For several minutes again there was that sense of just me out there on top of the water. But now, not alone. In fact, I had tons of company, literally. This is what I was looking for! First an encounter with myself and then with a living breathing ambassador for something sacred and free. A mascot of my inherent desire and right to freedom. Freedom of Self, freedom of thought, freedom to “be”. Transcending concepts and logic and the need to justify or define oneself. The whale just “is”. A giant symbol of the "unknown" from a world I can only peer into for a few seconds at a time. A creature that is so foreign to the world I live in, so free from the goals, aspirations and ailments of the culture that I've adopted and invested most of my life into, but yet, at this moment, we share the same water and breathe the same air. It finally surfaced again on the other side of my board. It swam underneath me and was now heading away from me. Then, with a sudden surge of energy, blind enthusiasm and fearless motivation, I jumped to my feet and paddled hard and deep after my new found ocean companion. I hoped that I could keep up for at least a few minutes before it disappeared into the ocean again. I felt it's salty exhale spray on my face and cringed at the smell of it’s fishy krill breath. I saw it's huge amazing body slice thru the water over and over again. In-between paddling hard to keep up with it I also sat patiently, quietly, waiting for it to resurface again for the air that we both shared. In some ways the waiting and listening was my favorite part. The air was thick with mystery and anticipation. I submerged my head into the water to listen to it's whale song and couldn't believe how loud and clear it was. The whale surfaced and submerged a few more times before heading further out to sea. I had gone as far out as my mind could tolerate and slowly paddled back to shore. I was and still am completely moved by the grace of this animal and humbled by it's magnificence. Something about it's very existence has me spell bound. 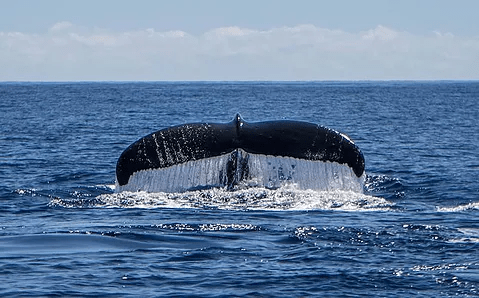 That was one of my very first experiences with the Humpback Whales that migrate from Alaska to Maui from December to April every year to mate and have their offspring. Since then I’ve had dozens and dozens of beautiful amazing experiences with them. Their ancient intelligence is palpable as is the beautiful “aloha” energy of Maui. I am grateful to live in a place where their presence is so strong and frequent. It has changed my life. I’ll tell another whale story in a future blog. Thanks for reading.